Finishing off our trip, Zion provided views so incredible, we swore we were in heaven. If you’re following our trip plan, then you’ll be entering Zion from the side entrance rather than the main entrance in Springdale. This should make your entrance into the park far less crowded. This is one of the busiest parks in the whole National Park Service. Busy enough that during the busy months, you aren’t allowed to drive in the section of the Park where most of the famous hikes are. You’ll have to take a tram to these locations. These trams can make this rugged and beautiful National Park feel a little like Disney or Busch Gardens with the massive crowds only adding to that. Regardless, this Park is a must for any admirer of the outdoors, lover of long and strenuous hikes, or Instagram celebrity. I kid a little on the last one but you can thank/blame social media for this park getting overcrowded. It is extremely likely that this park will require reservations in the coming years. I highly recommend that you stay at the Zion Lodge if you can. This will save you an incredible amount of time as you won’t have to ride what many described as an hour or more ride just to the visitor center on a crowded tram before boarding another tram to actually make it to any of the hikes in the Park. So many to choose from. On your way in from the side entrance is a short hike called Canyon Overlook Trail. 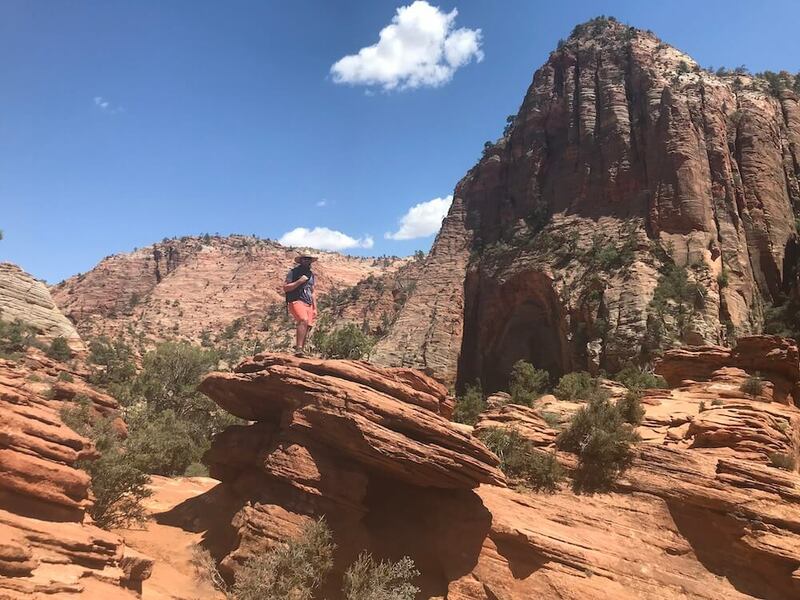 It provides great views without a lot of effort and will be one that you’ll want to do before Angel’s Landing or Observation Point as they will definitely overshadow it. Regardless, it is worth the hike. For a truly once in a lifetime experience, wake up early and hike as far as you can in the Narrows. The Narrows is a slot canyon with a river running through it that you can hike. Just like anything in these Parks, make sure to check the chance of rain beforehand as you definitely don’t want to be in the Narrows when a flash flood hits. Also, I would absolutely recommend renting the water boots, neoprene socks, and walking stick. We got ours from Zion Outfitter just outside the main gate. You can pick them up the evening before your trek through the Narrows so you don’t have to fight the crowds on your way back into the Park. 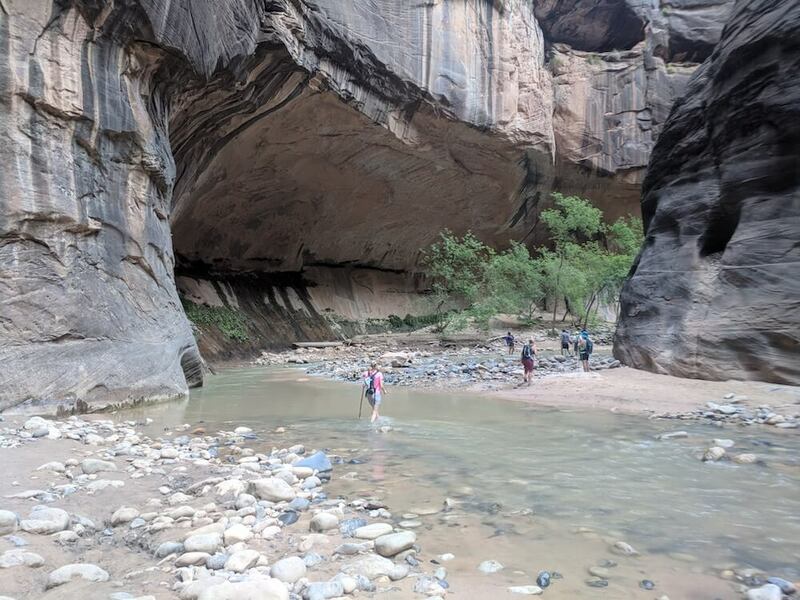 Unfortunately for us, a flash flood destroyed a few trails in the days leading up to our trip so we weren’t able to do the famous Angel’s Landing. However, Observation Point, which offers arguably a better view of the same vantage point from a few hundred feet higher elevation was one of the highlights of the trip. Wake up early to avoid the crowds and the heat. There are two ways to get to Observation Point. The traditional way is to start at the Weeping Rock Trailhead and climb 2,000 feet in elevation over the course of around 4 miles. However, if you need an easier route there is also a much less known trail that starts at the East Mesa Trailhead which you actually get to from outside Zion. Hands down the best choice is to stay at the Zion Lodge. You can stay in Springdale to save money but you’ll wish you were staying in the Park after your first hour ride to the visitor center on a crowded tram. The Zion Lodge allows you to get out on the trail earlier than if you were staying in Springdale. This is a great for avoiding crowded trails and the summer heat. The trailhead for the Emerald Pools is also right across the street from the lodge which is another benefit. Not to mention the unreal stargazing we saw just outside our cabin when we woke up at 3am randomly in the middle of the night. The pros of staying at the lodge far outweighs the con of the price being more expensive. 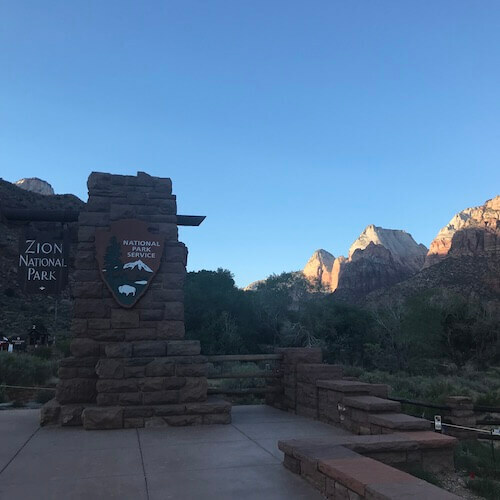 While staying at Zion Lodge is the absolute best choice for lodging, the Red Rock Grill at the Zion Lodge is not nearly as good as many options in Springdale. We ate at the lodge one of the nights and while it was a great view, the food was only ok. The great thing about staying at the Zion Lodge is that it is easy to leave the Park to go to Springdale to eat far more delicious options without having to ride a crowded tram out. You can just drive your own car that you’re allowed to park at the Zion Lodge.  As for what options to partake in while out in Springdale, three come to mind as enticing options. The Spotted Dog Cafe, Meme’s Cafe, and the Barefoot Taqueria. The Spotted Dog Cafe was great and we enjoyed sitting out on the patio, taking in the view that was every bit as good as the one from the restaurant at the Zion Lodge. If you’re looking for some seriously tasty Mexican food, look no further than Barefoot Taqueria. The tacos here are killer. For late breakfast on our last day in Zion we ate at Meme’s Cafe and it was delicious, but the lunch and dinner options looked equally as great. We drove in from the North Rim and spent the afternoon of that first day as well as one more full day and a morning and early afternoon of the third day in Zion. If flash floods hadn’t destroyed some of the hikes we wanted to do we could have easily stayed another day or two here. 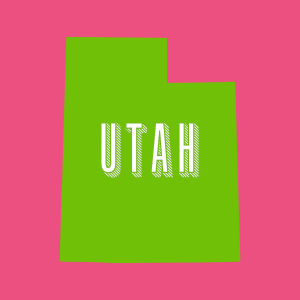 Springdale is a fun town to explore and Zion is marvelous. However, it is also one of the busiest Parks in the National Parks system during the summer, so if you can avoid getting there on a weekend, I highly recommend you do so. When we arrived Sunday mid-day, it was easily the busiest National Park of our trip. By Monday morning, some of the dense crowds had subsided and while it was definitely still packed the rangers we spoke to said that it was nothing compared to a Friday or Saturday. So, I’ll reiterate avoid summer weekends. Even better is going during the shoulder season when the crowds are greatly diminished. 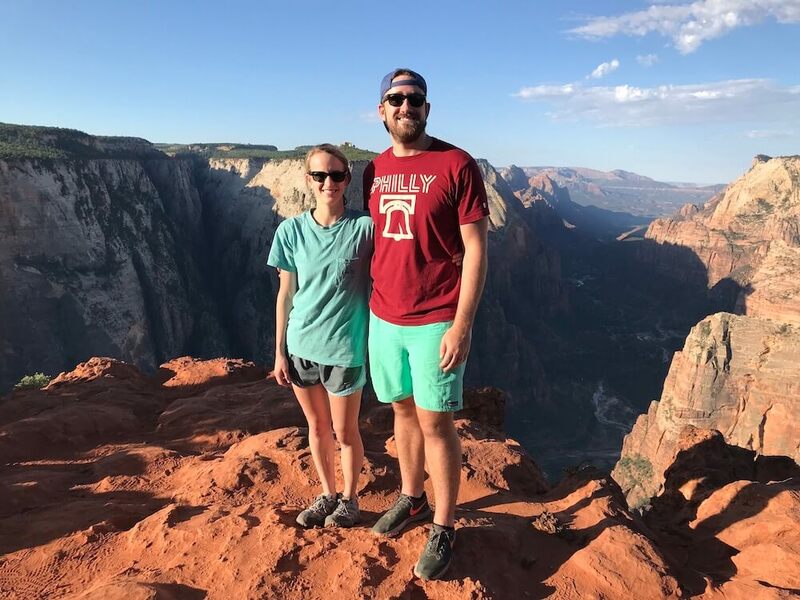 Don’t forget to choose the perfect Insta filter for your photo of you at the edge of Angel’s Landing! In all seriousness, this is a gorgeous National Park and one that didn’t earn the crowds for no reason. It is also an easy drive from the cheap flights in and out of Vegas if you’re looking for making a weekend trip.